The inevitable has happened, sooner than I thought. A filmmaker has been assaulted on the sets of his own film by a terrorist group on flimsy grounds and the government authorities are silent. And it’s not surprising anymore. 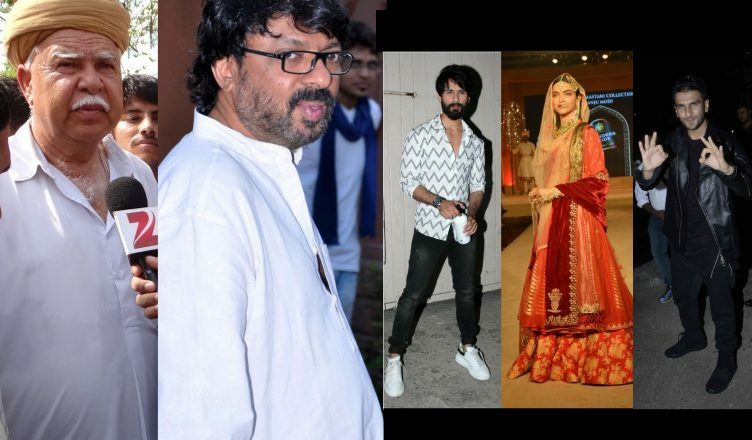 For those who came in late, acclaimed filmmaker Sanjay Leela Bhansali was slapped on the sets of his film Padmavati in Jaipur yesterday (January 27) by members of what can be called a terrorist organization, Sri Rajput Karni Sena. Their grouse is that Bhansali is distorting history. The movie is based on Alauddin Khilji’s obsession for Padmavati, which ultimately lead to the latter taking up her own life. SLB was shooting a dream sequence and probably it showed Alauddin romancing Padmavati. The terrorist organization members got a whiff of such a sequence being filmed and they vandalized and ultimately attacked the filmmaker. A mass murderer should not be glorified is what they feel. And let me clarify here that these terrorists haven’t read the script at all so they are not wholly sure how exactly is the film going to present Khilji. But then, fringe elements in our country have rarely worked as per logic and common sense. As always, the members of Bollywood fraternity came out on Twitter to express their outrage after attack. As expected, the cops held 4-5 protestors, who must be the junior most ‘employees’ of the said organization and hence their arrests mean nothing. The head of the organization who gave the go-ahead of the attack is relaxing and even held a press conference where he justified the attack. I am no longer surprised that Lokendra Kalvi, the founder of this organization, is not arrested. The arrested goons too would be let off when things cool down. This has always been the case. Our filmmakers have been threatened in the past and theatres vandalized as they were showing films, that hurt the sentiments of publicity-seeking organizations. Never in such cases have been the mastermind jailed when the fact is that all such activities are illegal. A recent example is of Ae Dil Hai Mushkil controversy when Maharashtra Navnirman Sena (MNS) members threatened director Karan Johar since the film featured Pakistani actor Fawad Khan. The members even forcibly entered a premium Mumbai multiplex, Metro INOX (then Metro BIG Cinemas) and raised slogans. Ameya Khopkar, the head of MNS Cine Wing kept threatening Karan openly. Finally, Maharashtra Chief Minister Devendra Fadnavis intervened but no, he didn’t put Ameya or MNS head Raj Thackeray behind bars. He brokered peace between them and KJo had to agree to donate Rs 5 crore for our soldiers! Earlier, filmmakers were simply threatened, their effigies burned and as aforementioned, cinema hall showing the objectionable film was vandalized. (Yes, there was a rare instance of a Hansal Mehta being badly humiliated and physically attacked for a so-called controversial line about Kolis in Dil Pe Mat Le Yaar. But he was not a prominent filmmaker then). But these fringe elements have now gone one step forward. They have started slapping highly respected filmmakers. Tomorrow, they’ll break their bones and one day, they’ll start assassinating too. And as always, the government will stay silent while the industry will keep expressing anger on social media but never come united in the real world and pressurize the authorities to take stern steps. This is the new normal of our times and it’s high time we get used to it. Till now, the government of Rajasthan has not given any official explanation as to what action they are going to take against Sri Rajput Karni Sena. Chief Minister Vasundhara Raje has been silent and she did tweet today, about freedom fighter Lala Lajpat Rai’s birth anniversary, but nothing about the attack. As I have said, nothing surprises me anymore. This has been happening over the years. During Congress rule, Shiv Sena thwarted the release of My Name Is Khan on its first day at many places in Mumbai. Even the Hansal Mehta incident happened during the same regime. Governments change but the scenario doesn’t. Fringe elements run riot while creative people have to always fear, not knowing who might get offended with their piece of work. But nothing could be done. Let’s learn to adjust with it and move on!